Beeper drew some animal designs for a couple of new t-shirts for Mr Beeper's birthday this year. The animals are two of Mr Beeper's favorites--the komodo dragon and the platypus (incidentally, also two of Beeper's faves). The komodo dragon tee has a little know animal fact that Beeper chose to add: baby komodo dragins roll in animil waste. Unlike last year's tee, I left Beeper's spelling intact since it is decipherable this year and pretty damn cute in that 7-year-old-spelling sorta way. 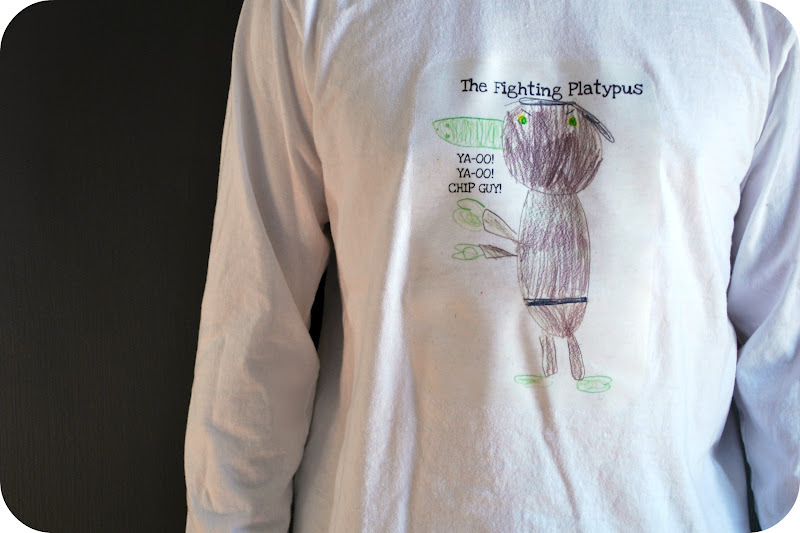 The platypus tee is all Beeper's goofy sense of humor--no, I don't know why the platypus is saying, YA-OO! YA-OO! CHIP GUY!--but it cracks Beeper up so why change a thing? 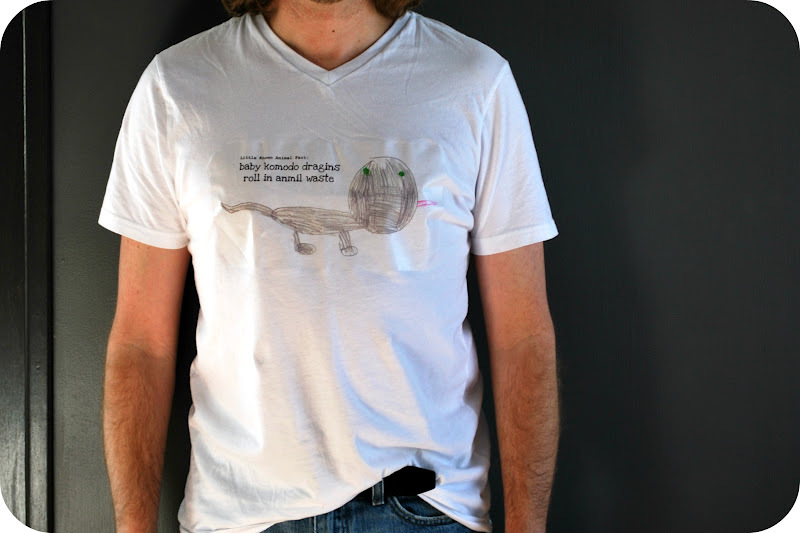 Of course, Mr Beeper loved the tees and actually wore the komodo dragon t-shirt to work last week. One of his coworkers assured him he could sell the Komodo dragon design--I guess grody little know animal facts have mass appeal. Oh hell yes he could sell them! Where do I sign up? Those are awesome! These are pretty adorable. 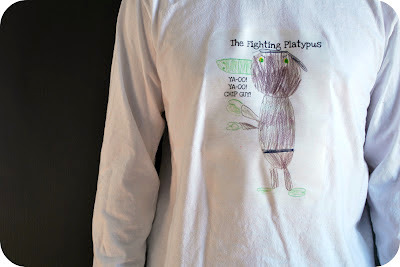 I love the fighting platypus! Christina, I scanned in the image, used some photo editing software to add the words, then printed them on inkjet t-shirt transfers--you can buy them at many office supply stores or ca find them in the computer supply section of places like Target. It's simple. You can also bring a t-shirt and the drawing into a place like Kinkos and they will transfer it for you.